Flights are grounded, ATMs aren't working, cell phones are out and a few cable TV channels aren't available in Nunavut and other northern communities due to a malfunctioning satellite. Telesat Canada says this is an extremely rare occurrence and is working to restore service. Flights are grounded, ATMs aren't working, cell phones are dead and a few cable television channels aren't available in Nunavut and other northern communities due to a malfunctioning satellite. 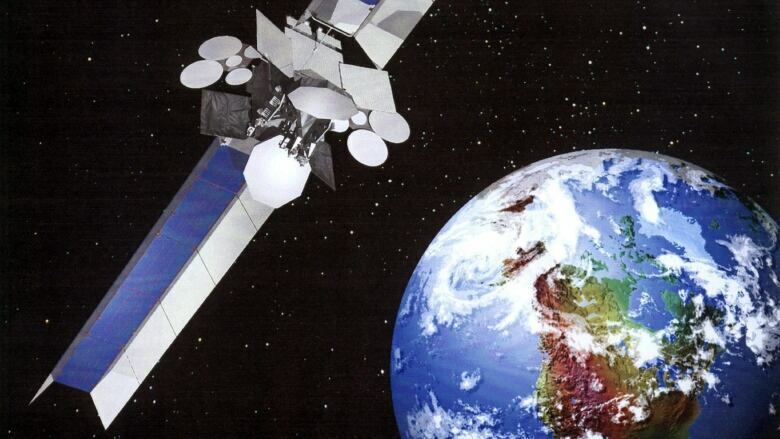 Telesat Canada says it has established contact with the satellite that is causing the major communication problems. John Flaherty, Telesat's director of marketing, told CBC Radio that his company is now communicating with satellite Anik F2. He says it experienced a "technical anomaly." Flaherty says when a satellite malfunctions, it turns away from the Earth and towards the sun so that it won't disrupt other machinery. "This is very rare and I think that's why it gets so much attention because it happens so rarely," said Flaherty. "If you look at Telesat's experience with our fleet, we typically have in excess of 99.99 per cent availability, so it's a very unusual occurrence." He said service could be restored by midnight ET, even though the reason for the breakdown is still unknown. Meanwhile, most scheduled flights from Nunavut communities have been cancelled until the malfunctioning satellite is fixed. Nunavut Premier Eva Aariak is urging residents not to use their satellite phones unless it is an emergency because it can jam lines. Medevac flights will still be dispatched, and search and rescue activities will not be affected. Northwestel said 39 communities across Nunavut, N.W.T. and Yukon that receive their long distance phone service via satellite are affected by the outage, which began at about 6:30 a.m. ET. The satellite problem is also affecting Internet and other data services in satellite-served communities in N.W.T. and Nunavut, and some cable television channels have been affected, according to Emily Younker, manager of corporate communication for Northwestel. Aariak advised communities to activate their emergency response committees, and she also instructed health centers and wildlife officers in the communities to turn on their Iridium satellite phones immediately. The RCMP are also using CBC North Radio to send messages to their Nunavut detachments, asking officers to check in to the Iqaluit command centre by satellite phone. Satellite phones are working in the affected communities as they do not use the malfunctioning satellite. People in Iqaluit are reporting they are without cellphone service and long-distance calling, bank machines and debit-card machines. At least one bank in the city has not opened today as a result. Flights are grounded, though one flight from Ottawa is expected to land in Iqaluit this afternoon. Local telephone service is not affected. An earlier version of this story reported an erroneous figure regarding communities affected by the long-distance phone service outage. In fact, it is 39 communities.